It's Monday again! We're recovering from a fun and action packed Spring Break! I wish I could have another week like this because I enjoyed having my boy around! 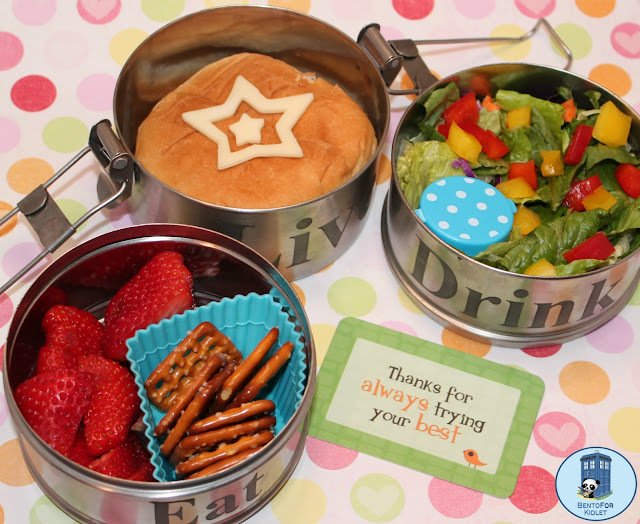 Kidlet has a Quorn turk'y burger with cheese decoration, salad with dressing, strawberries, and pretzels. Now it's your turn! Show us what you've got! Boooo...sorry it broke. I was just going to say what an awesome box. Love the words printed on them. Great lunch and thanks for the linky! So sad to lose a favorite box!!!!!!!!!!!!!! Sorry to hear the tiffin broke! Lunch looks good! Such a cool bento though.